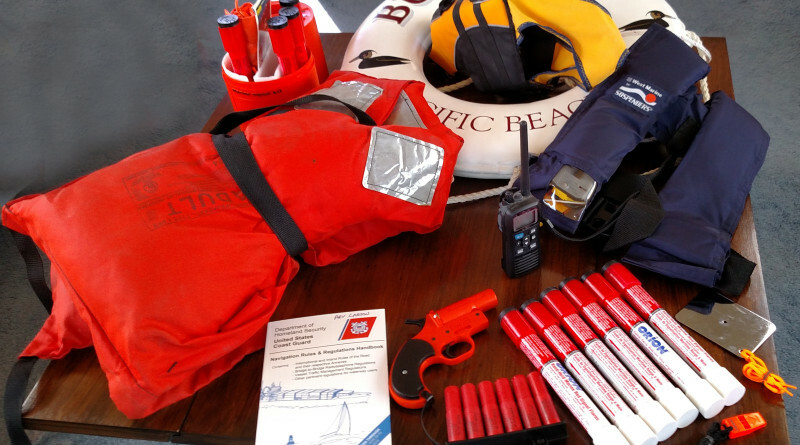 Did you know you’re legally required to carry certain safety-related equipment on your boat? Did you also know the U.S. Coast Guard has the right to stop you at any time to conduct a vessel safety inspection? While compliance is mandatory under federal law, the reality is, under current staffing constraints the USCG rarely stops boaters for such safety inspections unless they suspect something illegal, such as drug smuggling or human trafficking. It’s wise always to comply gracefully and invite the inspectors aboard. The best way to ensure you’re ready for an unexpected safety inspection is to undergo a free U.S. Coast Guard Auxiliary (USCGA) or U.S. Power Squadrons (USPS) boating safety check, conducted as a courtesy by these organizations’ trained volunteers. Many marinas and yacht clubs arrange for inspectors to do safety checks on tenants’ boats. Some areas, like San Diego, also have a specified location and schedule where boaters can bring vessels for checks. Arv and I like to have our boat inspected annually, but sometimes, if we’re traveling on our marina’s inspection day, that’s difficult to arrange. Most years at boat shows we put our names – he as a boat owner, I as media interested in doing a story – on lists requesting a boat inspection. In more than 20 years Arv has had only one or two follow-up calls; I’ve received none. We’ve learned in order to arrange an inspection we usually have to rattle cages until we connect with a senior officer of the local USCGA sector. Going this route, we’ve encountered several outstanding inspectors who have shared their extensive knowledge about the provision and use of safety equipment. The main reason to have an official vessel safety check is ensure you have the minimum federally-required safety equipment on board your boat and all are functional which includes working navigation lights, fully charged fire extinguishers, a full complement of visual distress signals, non-expired flares as well as an adequate number of personal floating devices (PFDs) or lifejackets. The inspector will also examine your registration or documentation and check the size and placement of your registration numbers. In preparing for a safety check, be sure to download the list of required equipment from the USCGA’s website at cgaux.org/vsc, where you can also fill out a form requesting a vessel safety check. When going through the checklist you’ll quickly note what isn’t legally required, but otherwise necessary, such as first aid kits, marine radios, emergency position indicating radiobeacons (EPIRBs) as well as paper/electronic charts and other modern electronics. Please consider the checklist as the absolute minimum equipment needed for safe boat operation. Use your vessel safety check as a pretext to consider what level of working equipment you really need on board for safe boating and plan accordingly. In addition to the safety and educational aspects, there’s another real advantage to displaying the valid decal of a boat safety check. Should the U.S. Coast Guard or any other maritime law enforcement agency stop you, your up-to-date decal will indicate you’re a responsible boater and your vessel recently passed an official Vessel Safety Check. It boosts your credibility and provides a contrast to other boaters lacking such proof of inspection. During my Chesapeake Bay boating days, I heard from many boaters who were initially stopped for a safety inspection and were waved off once law enforcement officers noted their valid inspection stickers. Knowing your safety equipment is fully functional brings added peace of mind while on the water. Make arrangements with the USCGA or USPS for your vessel safety check this year. Can you provide a link to the required list? Recent boat owner needs list of required safety gear.